DAMASCUS, Syria (AP) — Syrian media said international chemical weapons inspectors on Tuesday entered the town of Douma, where an alleged poison gas attack was carried out earlier this month, but a Syrian diplomat said later that only a U.N. security team visited the Damascus suburb. The reported attack led to Western airstrikes against the Syrian government over the weekend. The team's entry into Douma came 10 days after the alleged attack, raising concerns that any evidence the inspectors find could be useless. On Monday, OPCW Director-General Ahmet Uzumcu said Syrian and Russian authorities had blocked its inspectors from going to Douma and instead offered them 22 people to interview as witnesses. The team arrived in the Syrian capital of Damascus on Saturday. Journalists in Damascus were prevented by government minders from contacting the OPCW inspectors, and The Hague-based organization refused to comment on "operational details regarding the Douma deployment." U.N. Secretary-General Antonio Guterres said it was the "obligation of the Syrian government to provide all the conditions for (OPCW inspectors) to work without any restrictions." British Prime Minister Theresa May accused the Syrian government and its ally Russia of trying to cover up evidence and obstruct the investigation. 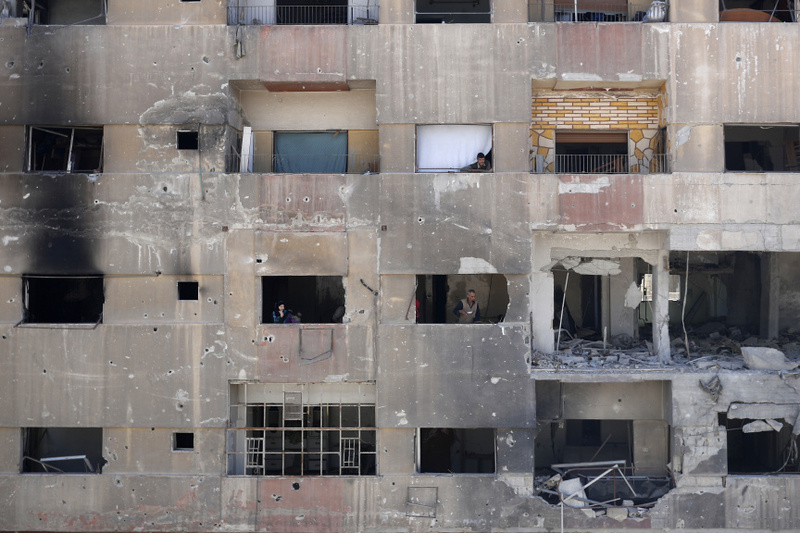 The OPCW is investigating reports that government forces gassed sites in Douma on April 7, when the town was still held by rebels and home to tens of thousands of people — residents and others who were displaced by fighting elsewhere. Syrian activists said more than 40 people were killed in the alleged attack. The U.S. and France say they have evidence that Syrian President Bashar Assad's military was behind the poison gas attack, but they have made none of that evidence public. On Saturday, the U.S., France and Britain bombarded sites they said were linked to Syria's chemical weapons program. Journalists were allowed access to Douma on Monday. The Associated Press spoke to survivors and witnesses who described being hit by gas, fainting, and discovering their relatives had died, with foam bubbling around their mouths. The Syrian government and Russia have denied using chemical weapons and accused rebels, with Western backing, of using such weapons or faking such an attack. Russian Foreign Ministry spokeswoman Maria Zakharova dismissed allegations that Russia was trying to hamper the OPCW inspectors, saying Moscow strongly supports their mission to Douma. Alexander Rodionov of the Russian military's chemical weapons protection unit said its experts found chlorine and components for producing mustard gas at a rebel laboratory in Douma. He said the canister with chlorine was similar to one shown in images released by activists in the days after April 7. Russian President Vladimir Putin told German Chancellor Angela Merkel that the Western strikes had violated international law and set back the peace process, the Kremlin said. But French President Emmanual Macron defended the military action in an impassioned and at times angry speech to the European parliament. He spoke of the "outrage by images we've seen of children, women who died of a chlorine attack." "Do we sit back, do we defend (human) rights by saying, 'Rights are for us, principles are for us, and realities are for others?' No, no!" the French leader said. "Three countries have intervened, and let me be quite frank: this is for the honor of the international community." The alleged attack and subsequent military response underscored the challenge that the seven-year conflict in Syria poses for the West. President Donald Trump wants to remove U.S. troops from Syria, where it has been fighting the Islamic State militants. A new strategy appeared to be crystalizing to let the U.S. leave Syria without relinquishing its interests to Assad government or his allies, Iran and Russia. Saudi Arabian Foreign Minister Adel al-Jubeir said the U.S.-aligned kingdom could deploy forces from a bloc of mostly Sunni Muslim nations that was established to fight terrorism. He said the Obama administration did not agree to such an offer. The kingdom has supported Sunni rebel groups fighting Assad's forces, which are backed by Shiite-majority Iran. Saudi Arabia is also a member of the U.S.-led coalition battling IS militants. The OPCW visit to Douma came hours after Syrian media reported airstrikes Tuesday on government military installations in the central Homs region and the suburbs of Damascus, but the military later said a false alarm had set off air defense systems. Explosions were heard in the areas of the two bases, according to the Britain-based Syrian Observatory for Human Rights, which monitors the conflict via a network of sources in the country. But it said no missiles landed inside the bases. Earlier this month, four Iranian military personnel were killed in an airstrike on Syria's T4 air base, also in Homs. Syria, Iran and Russia blamed Israel for that attack. Israel did not confirm or deny it.